One of the more exciting trends in office furniture today is the advent of the standing and adjustable conference table. These taller desks can easily adjust to participants’ heights to improve focus and increase energy during internal or client meetings. Instead of falling asleep or looking at smartphones during a lunch meeting or conference, you and your employees will be alert and ready for whatever is on the agenda. A standing height conference table that stays that way is more challenging, so many models are adjustable. However, standing height chairs are also available that allow you to sit even at a higher table. There are pros and cons to regular height conference tables and standing height conference tables. Learn more and decide which is right for your office and working style. When you stand for a good portion of your working day, you’ll be more awake, active, and you can reduce your risk for heart disease, diabetes, and other health problems. It can even shorten your meetings by 34%, according to a 1999 study from University of Missouri researchers. There are reasons to believe that standing can increase productivity, releasing endorphins, increasing energy, and helping coworkers accomplish tasks. With everyone standing, it’s more difficult to surreptitiously check your phone or use your computer for social media, eliminating most causes of distraction. For many employers, standing height conference rooms are a wonderful way to increase efficiency and improve employee health. While standing is good for your health in general, prolonged standing can hurt concentration and be unhealthy. Standing boosts energy certainly, but relaxing and using the endorphins are also necessary. The best compromise is sitting and standing throughout the day. An adjustable standing height conference table provides the best of both worlds, allowing you to choose whether to have a standing or seated meeting. 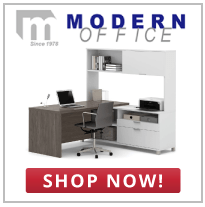 Find the right conference table for your meeting room at Modern Office Furniture, where we have a wide selection of affordable, high-quality seating options.